An adjustable-height lectern offers a great deal more flexibility than a fixed-height podium. 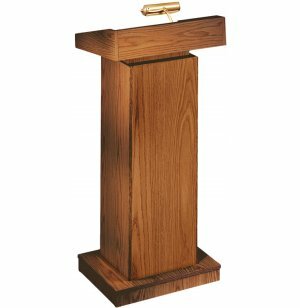 The lectern is adjustable up to 52 inches high so that even if your speaker is very tall, the podium will look like its custom built. 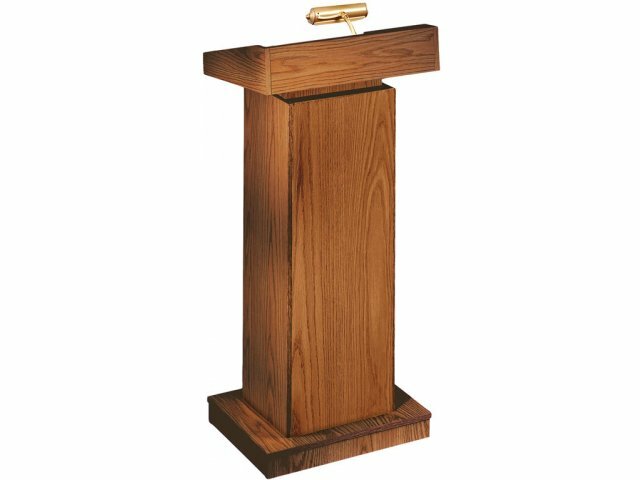 The professional looking full-size lectern comes with a built-in brass lamp and a digital clock to keep an eye on the time while speaking. The extra-wide surface easily accommodates speaker's notes and other material and the raised bottom edge keep materials in place. While the podium looks like it is a permanent fixture, four easy-roll casters allow you to move it whenever the need arises. Height-Adjustable From 42" to 52". Four Easy-Roll Casters are Concealed Under an Elegant Cabinet With Gold Trim. 22"W x 19"D Large Reading Surface. 12"W x 4"D Inner Shelf.